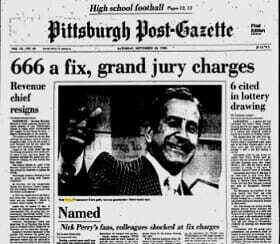 If you lived in Pennsylvania in 1980, and were old enough to read a newspaper, I’m pretty certain you’ll know all about the Nick Perry lottery scandal. But for those of us who don’t know, and for those who love a good conspiracy story – here’s the one about the Pennsylvania lottery scandal. In 1980, the Pennsylvania lottery ran a game called Daily Number. It’s still going today, and is your classic Pick 3 lottery game. Back then the WTAE TV channel broadcast the daily draw, and the host was one Nick Perry. Nick was a local, born in Pittsburgh in 1916. He’d previously delivered the news on WTAE, but took over as host of the daily lottery show in 1977. Nick Perry is always quoted as the ring leader of the plot, but it’s quite possible his partners in crime were equally responsible for the conspiracy. They were very quick to point the finger for lighter sentencing as we’ll see later. The plot was initially conceived via a discussion between Nick and the Maragos brothers – two guys he already knew and worked with in a separate vending machine business. Once the idea was on the table, more recruits were needed to pull off the plan. Art Director at the station, Joseph Bock, was next recruited for his particular expertise. The idea was to switch out the regular lottery balls for the draw, and substitute them for a set of specially weighted balls that would greatly bias the result. Bock was left to come up with the final design, which involved creating a fake set of balls using a heavy latex based paint on the balls they didn’t want to come out of the machine. The balls bounced around and were then sucked out of the top of the machine, hence the need to weight those that were not wanted. The group decided they would weight all numbers but the 4’s and 6’s, leaving only 8 possible combinations that should be able to make it out of the machine. Obviously the lottery draw had some security in place. Perry couldn’t just roll up to the studio and swap the balls over with nobody noticing. So more recruits were required. A stagehand for the TV company was enlisted to make the switch. With a lottery official also added to the payroll to ensure he would leave his post for a few moments at the appropriate time. It worked. The swich was made and the modified balls were ready to be loaded into the machine. On Thursday evening, the 24th April 1980, the Pennsylvania Lottery drew the numbers 666 on the Daily Number. Bock’s set of fake balls had done their job, and one of the gangs 8 wanted results had been drawn. Nick Perry and his partners had been careful to remove the dodgy balls and destroy them right after the draw. But the gang had been far less clever about how they had bought their tickets for the game. The Pennsylvania Lottery had a record breaking $3.5 Million in winnings on their hands. Which alone did not mean any wrongdoing. What really triggered the alarm bells though was when a very small group of people, with a large number of winning tickets, came forward to claim most of the prize money! Naturally, an investigation was launched. And as the lottery company started to check the locations where the tickets had been bought in large numbers, suspicions grew. One cigar store was happy to sell over $1,000 of tickets in one hit to the group. It wasn’t long before the investigation connected the Maragos brothers to Nick Perry. They had actually phoned his personal line at the studio whilst waiting for large numbers of lottery tickets to be printed at a bar. All the tickets they bought were for the same set of 8 combinations. The gang quickly crumbled under interview, and happily pointed the finger at Nick Perry as the ring leader. All of the gang members were brought to trial. But the Maragos brothers avoided being sent to prison by helping to convict Nick Perry, and the lottery official. The Maragos brothers were more than happy to state that Nick came to them with the whole idea. And stuck the knife in by saying that he wanted to fix the result every 6 months or so. They got away with 5 years probation and fairly modest fines. Nick however was given 7 years detention for his part in the scandal. He died in 2003, but always maintained he was innocent of the whole scandal. Apparently some do still refer to the result 666 as a Nick Perry though. The lottery official who left his post was given a 2 year sentence. Whilst the others were awarded lesser terms for guilty pleas. A lottery scandal on this scale obviously severely hurts the credibility of any lottery game. So Pennsylvania were quick to make changes. Security procedures were greatly increased – a move closely watched and subsequently followed by other lottery companies. And the lottery draw was taken away from WTAE and given to another channel, WHP. And in the 32 years since the Pennsylvania lottery scandal hit the headlines, there hasn’t been a single report of a lottery being rigged. Were those increased security procedures therefore enough? Or is it possible to do a better job of cheating the lottery, and rig the draw without getting caught? UPDATE: They made a movie out of it! I haven’t seen it yet, but the movie ‘Lucky Numbers’ was based on this story (names were changed). It starred John Travolta and Lisa Kudrow. You can find it here on Amazon (or here on Instant Video). Anyone seen it? I play the lotto here in South-Africa. All my numbers sometimes are being drawn, but I cannot find a way to get them all in the same line. Any advice what I should do. There are no miracle systems to get all those numbers on one line, just ways to increase your chances. Put your money in the bank. I honestly believe this is ongoing for almost the first few draws for each of the local and national draws and this set of specially weighted balls are influencing the outcome, making a combination impossible. My proof, those who watch closely all the numbers that come out, when you look at other draws you will always see a few similar numbers on both draws done on different days by one programmer or the ball swaps agents. It’s not random and it happened every week! Not sure I understand what you’re saying Nick. But you will of course see similar numbers come up in different draws, because there are only a small range of numbers that can be drawn..! That’s what random is. There are many millions of combinations, so how can have determined that any particular combination is “impossible” based on only a few hundred draws having ever been made? That’s like rolling a dice once, getting a 2, and concluding it’s fixed and 6 is impossible. Hi LG. Yes there are no miracle ways to get all numbers in one line. But those chances you refer to are Wheeling plans. And they do work, except the required number of games to cover the numbers are prohibitive. Seems like Isaac doesn’t know about wheeling. Wheeling is definitely useful, just not as magical as certain sellers of wheeling systems claim. For anyone wanting to try wheeling I recommend using Bluskov’s wheels as he has peer reviewed papers published in this actual field. Where do you get the people who draw the numbers, and why do most of the people sometimes have the same names. In the case of computer based draws the staff are hired (or promoted) just like any other job position with responsbility. Carefully, with background checks etc. ‘Most’ of what people ‘sometimes’ have the same names..? Are you talking about the TV presenters..? Because they don’t actually draw the numbers.